We've seen how to create a Document Type. If we wanted to create a simple three page site containing; Home, News and Contact Us pages we could easily just create a Document Type with a corresponding template for each and copy the same HTML code into each template and make the custom changes to each separate template for these pages. Though this would work (and on a very simple site it actually has some merits) but once a site starts to grow this would lead to problems - for instance changing anything in the header or footer would need to be done on each template - it also means we'd need the user to enter the same content for the footer on each page for example. 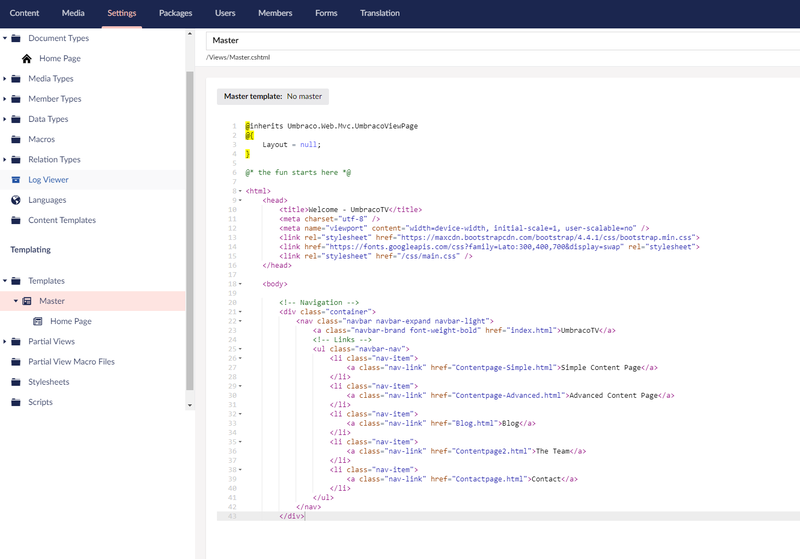 Umbraco provides us with an elegant solution for a consistent base template - those familiar with MVC will recognise it. To start we're going to unpick a little bit of what we did in creating the homepage to sit the homepage template under a master. Go to the Settings > Templates and open up the tree. At the moment we just have our Homepage template. Hover over the Templates menu and click the menu ... button. Create a new template called Master, click + Create and then give it the name "Master" . Remember to click Save. Now we need to move the parts of our HTML template that are common across all pages into the Master. This is where as a developer you might need to use your brain as it will be slightly different for different websites - e.g. do all pages contain a <div id="main"> section so can we put this in the master or does this belong to only certain pages? For this site, we will cut everything from the closing curly brace to line 39, so you get the end of the </nav> - we're going to move the header and nav of the site to the master template. Cut this and click Save. Now click on your Master template and paste this HTML markup after the closing curly brace and remember to click Save. 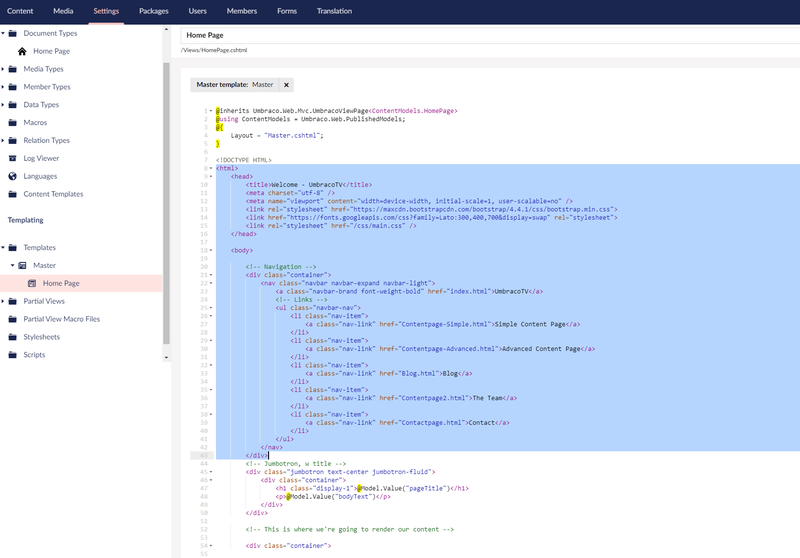 At the end of this markup we need to tell Umbraco to insert the child template's content - this is done by adding the code @RenderBody() at the end (around line 39). Click Save. Now we'll do the same with the footer content. Cut everything from the <!-- Footer --> comment (approximately line 111) from the Settings > Templates > Homepage template, click Save and then paste this into the Master template under the @RenderBody field we've just added. Remember to click Save.